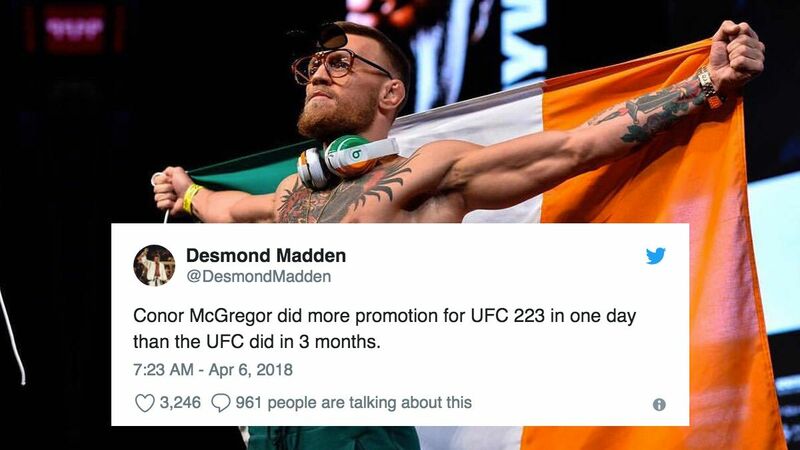 The fight community is in utter shock after Conor McGregor went ballistic, attacking a bus full of mixed martial artists in New York City on Friday. Footage of him throwing things at the vehicle that had just come from a UFC 223 press event immediately went viral online. His irresponsible actions resulted in multiple injuries, including a bloodied Michael Chiesa. TMZ Sports reported that the Irish double champion has turned himself in, but that couldn't prevent UFC President Dana White from calling the incident "the most disgusting thing that has ever happened in the history of this company." Undefeated lightweight Khabib Nurmagomedov, who was in the bus and is said to be the target of McGregor's ire was quoted by MMA Fighting, "I am laughing inside. You broke window? Why? Come inside. You know UFC don't let you come inside. If you real gangster why don't you come inside?" There are rumors that the ugly fracas stemmed from an earlier run-in between Nurmagomedov and Artem Lobov, who is a close training partner with The Notorious. Amid flak over his deplorable fit of rage, Mcgregor got the support of some netizens, who lauded the athlete for defending his comrade. He even received the stamp of approval from the unlikeliest of people. And despite White saying he no longer wants the franchise to be connected to McGregor, others saw the episode as something rather exciting. Go figure. What would UFC story be without a WWE (and video game) reference?